The newest collection by Crate Paper is called The Pier. I'm in love with this summery collection! It has inspired me to scrap some beach and pool photos, and that's always a fun subject! The entire collection is available now at Two Peas here. Check out the slide frames and ephemera pack - they are so fun! My first layout using The Pier was created for Creative Weekly at the Crate Paper blog last month. Our theme was Color Collage, meaning a collage type of design focusing on one color family. I chose to work with the lovely blues/greens in the collection. This photo shows my boys at the beach a few years ago. I love how the colors of the ocean complement the colors of The Pier collection perfectly! I started off using this mask with acrylic paint plus some splatters of Mister Huey in Mint Julep. Then I layered lots of papers and embellishments and added one of the slide frames on top of my photo. The result was just right for a beachy photo... and I have quite a few more that I'm planning to scrap with this collection! Oh I LOVE LOVE LOVE this layout!! Gorgeous!! I love everything about this layout!!! 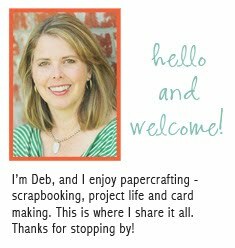 This layout is stunning, Deb! Gorgeous! I just ordered this line!